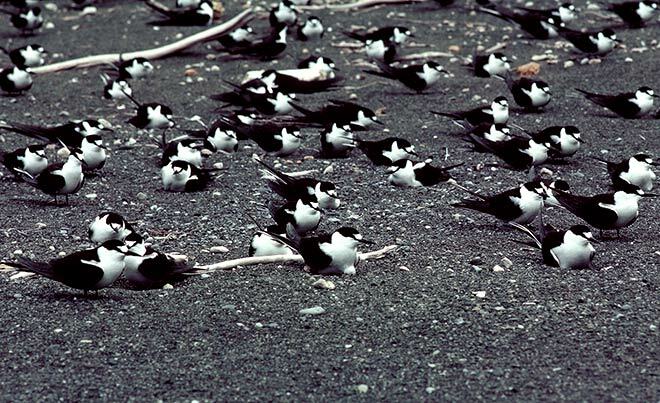 Sooty terns are a tropical and subtropical species, and the New Zealand population breeds on several islands of the Kermadec group (north of the North Island), including Raoul Island, where this colony was photographed in 1977. Cats have been on the island since the 1800s, and Norway rats came ashore from a shipwreck in 1921. As a result, the population of sooty terns dropped to 80,000 pairs in 1967 and 2,000 pairs in the mid-1990s. An operation to eradicate cats and rats from the island in 2002 was successful, giving the sooty terns and other birds there a chance to recover.